What’s Color Got to Do with It! I see the beauty of the world and all my surroundings in nature, mind, heart and soul because I see in color. During tough times- losing my husband, spending four and one half months in rehab after an accident, and one year of learning to walk again I began to Color My World. Trying to find something that would fill my empty hours and workable for my handicap I remember home and my Mother, my first teacher. She would seat her eight children at the large dining room table, give those blank sheets of newspaper print, crayons, and place an object in the middle of the table and say: “Draw what you see.” She also taught us to make do with what we had. Gathering up my courage and limited knowledge of art, I walked into a neighborhood Store, School Of Folk Art and made a firm statement” I want to learn to paint”. Through the eyes of my instructor I began to see things a little differently. I began to see the petals of flowers, appreciate a sunrise, and the big beautiful blue sky”. After two bouts of cancer, I began to spend more of my hours practicing my painting skills. It was in a color theory class that I found that color does affect how we feel, how we think, how it affects our emotions, and how others see us. For example: red can represent anger, danger and stop, but red also represents the red rose, flower of love and the heart. A hue of color softens the primary colors and provides individuality, emotions, plants, and dress. The only color I have trouble with is grey, but grey does provide depth when used as shading. When I see grey skies, I smile and am reminded of the quote; “A sunny deposition is far better than a cloudy sky”. Painting helps me record nature in all its colors and helps me share the color and “share my joy of painting with you. My store name, From My Brush reflects how I see things in color. Does color affect your emotions? Does color affect how others see you? Does color affect your taste? Does Business and Social Media logos use color effectively? Is there a “U” in your word Colour? A Florida Artist Now living in Mt. Juliet Tn. Works in various mediums: watercolor, acrylics, pen & ink and watercolor wash, colored pencil and hand-paints glassware. The science of color is fairly straightforward – we have the three primary colors – red, green and blue (RGB), and a seemingly infinite combination of colors can be derived from them. Perhaps, the most well-known example of this color-mixing is the rainbow – seven colors, derived from the three primary colors, all arranged in a beautiful, composite illustration. Each color is important in the composite – the rainbow would not be complete if you took out any one color, would it? No one color is necessarily ‘better’ than another – we may have an affinity for violet or green or orange or red – but, they all are significant in their own way. They all matter. The rainbow of humanity can be viewed in the same way. In our physical, financial, emotional and spiritual lives, we are all of a different color – in the sense that each of us are unique state. 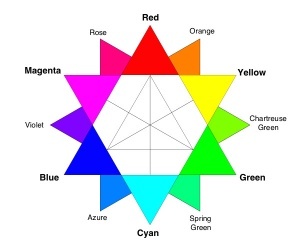 If violet were a ‘low’ state and ‘red’ were a high state (you can switch the order if you like), we all are somewhere along the spectrum, in the different areas of our lives. So, take a moment. Think about your physical health. Where along the spectrum are you? Where would you like to be? You can repeat the exercise for your financial, emotional and spiritual health, and other areas of your life. Now, if I were to ask all of you to take all those colors from your self-exam of the four primary areas, and add them all up, what is the final color you would get? (need help with color mixing? Try this tool :)) Let me theorize that the resulting color represents the composite, holistic aggregate of your health. The present. And the composite color of where you would like to be, represents our future. And the spiritual journey that we are going to undertake, will take us from the present, to our future. For some, the present and the future may be the same. They may feel that they have arrived. For some, there may be some gap between the color of the present and the color of future. I am here to tell you, that it is all, cause for celebration. As long as we are not color-blind, and we are aware of the color that our spirituality represents, and the color of that others’ spiritual health represents, we can celebrate. What are we celebrating? The fact that no matter what the color, we are all part of the bigger rainbow, and that no one color – in thought, word or action – can be discarded, without affecting the rainbow. So, that is what the Celebration of Colors (an Indian Festival called Holi) has come to mean to me. An awareness of our humanity, our uniqueness, our commonalities, our communities, and above all our colors! I hope you agree, that that is cause for celebration! P.S. Join the weekly gathering of our global, colorful, #SpiritChat community on Sunday, March 16th at 9amEDT on twitter for a “Celebration of Colors”. If you wish, I also invite you to create a “collage of color”, which we can then share with the community on twitter. If enough of you create and share collages, maybe we can create a mega-collage, to celebrate our community. Thank you. Here are the questions asked during the live chat. The answers are compiled in the storify summary. A full, complete transcript is also available at the hashtracking site (802 tweets, 71 contributors, 3.0M timeline deliveries, 0.37M reach). Enjoy!